Exciting New Arts Research Centre in Leeds to showcase work by academics in the Film, Music, Performing Arts and Art & Design departments at Leeds Beckett University. 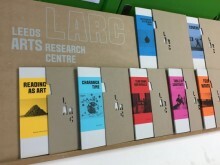 LARC draws on staff from the School of Art, Architecture and Design and from the School of Film, Music and Performing Arts. It brings together cultural historians and theorists with arts practitioners at the cutting edge of practice as research. Providing a forum for debate, it is also a window on the exciting and innovate creative work going on across the two Schools. Here staff collaborate on new projects, showcase their research and build together the research culture of the Leeds Beckett University. This is the place where creative minds gather and where ideas grow. This entry was posted on Friday, October 20th, 2017 at 3:12 pm	and is filed under Arrangements, Charanga del Norte, home, Performances, press and publicity, Publications, recordings, Research interests. You can follow any responses to this entry through the RSS 2.0 feed. Both comments and pings are currently closed.